In this article, I will introduce how an abstract form of mass, called complexity, generates Time Dilation between symbols. Conventionally, mass is a property of particles and atoms, however I propose there exists a different form of mass that is a property of symbols, and it's made of the intelligent relationships joining arrangements of matter (eg. logos, designs, etc.). The abstract mass will then be compared to regular mass with respect to the flow of time and space. 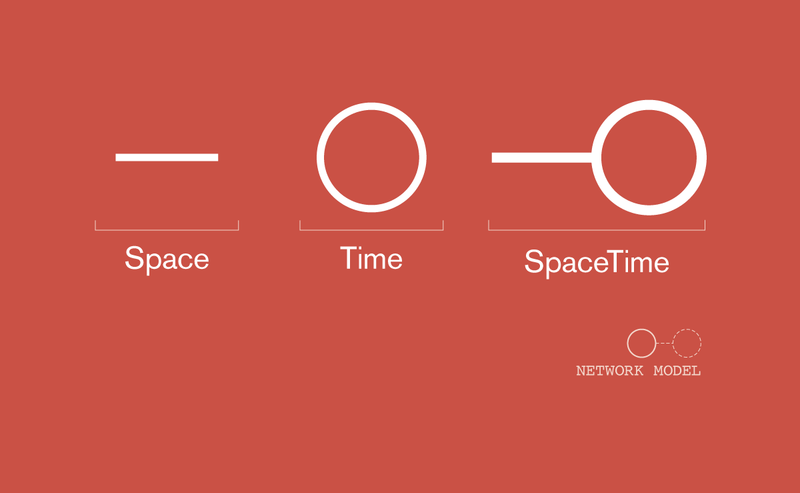 In physical space, motion takes place when an arrangement of matter changes positions over a period of time (d/t). 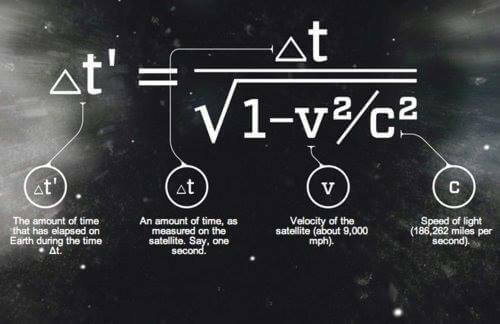 There are lots of things to be said about motion, and Einstein’s Theory of Special Relativity specifically explains how motion (and acceleration) through space produces a universal phenomenon called time dilation. 2) the object’s existence will age at a slower rate. For example, if a spaceship travelled near the speed of light it could reach the next star system in 2.1 years. However, the crew would have only experienced a 6-month journey. Unfortunately, this physical form of time dilation plays a minuscule role in our daily lives, because as human beings, our bodies of mass move too slowly across space to generate enough time dilation; so scientists don’t bother measuring the difference in elapsed time between earthbound citizens. However, can its principles be translated into a philosophy of mind? Do people somehow harness time dilation? Is education a method for cultivating an abstract form of it? Consider that the impulses of light in our brains travel near the speed of light, can these light speed interactions be somehow bound to symbolic masses that travel between positions in the mind? What if time dilation does in fact pervade human society — however in some abstract form that is caused by an entirely different type of mass? What if we actively manipulated time as we assemble structures in our minds? Perhaps within an abstract space are abstract masses (ie. symbols) that travel along abstract pathways (ie. relationship patterns), which span across all minds. Consider two people sitting still motionless, but speaking and coordinating information between themselves. In a physical sense, there is not much motion being generated (other than the motion of particles between their mouths and ears, and the waving of their hands). However, if visualized in an abstract sense, a motion (ie. transfer) of information might be seen, and if information can be thought of as a structure in some abstract space, it might be considered a type of moving object (symbol). These structures of information might move across mindspace according to some abstract laws of motion. I’m hypothesizing that there is an abstract space containing structures of information, that might be ruled by the same principles of physics regarding time, space, and vectors of motion. The structures of information, modelled within a hyper-dimensional mindspace, should be regarded as hyperspace objects that can also generate time dilation. So what are the basic consequences of physical and abstract forms of time dilation? Well consider that all time dilated organizations always appear to age slower. If a system is aging slower, it means that it will probably outlive the observer. A time dilated human could potentially outlive generations of people. So if there exists time dilated structures of information, they would also outlive other structures (symbols) of information. I am hypothesizing that the most important artifacts, books, documents, concepts, etc. are all structures of information that have harnessed time-dilation in order to outlive their contemporaries. All ancient things that have survived this far into the future, are extensive networks of abstract relationships with a greater lifespan vis-a-vis everything else of symbolic value. Highly networked organizations travel further across space within a single period of time because they move more information across their networks within the same amount of time as those of less networked observers. This leads to a greater possible change in environment for networked masses, and enables them to out-compete outsiders. Consider that education, support groups, and funding might provide us ways to manipulate abstract time dilation by finding, creating, and growing networks in mindspace. By measuring the abstract time dilation produced within a network, we might unmask the forces that cause evolution, competition, survival of the fittest, and ultimately, decision-making. And given the rise of the Internet, time dilation could be having a dramatic impact on our world, while we're completely blind to it. Believe it or not, but it took me 4 years to discover that pi2 ≈ phi2 + e2. In this article I'm going to explain what this connection means. Since the beginning of my adventure with Theory of Thought, I’ve always held that Pi, Phi, and e were fundamental concepts in my theory - particularly in a philosophical sense. But until I discovered this geometry I had had no idea how deeply interwoven these constants truly were. 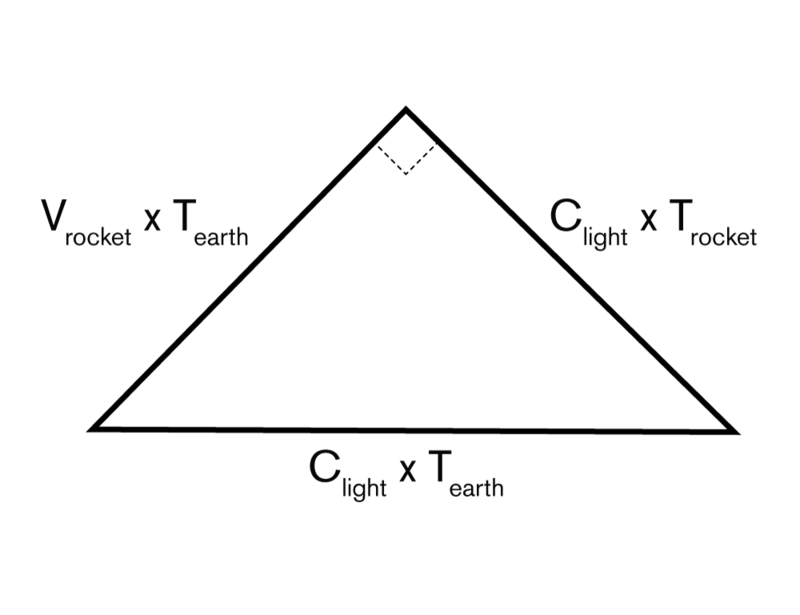 Since I already had a theory about these three irrational constants, it was awesome to discover that my theory also had a geometrical perspective that might explain the hidden framework holding a mind together. 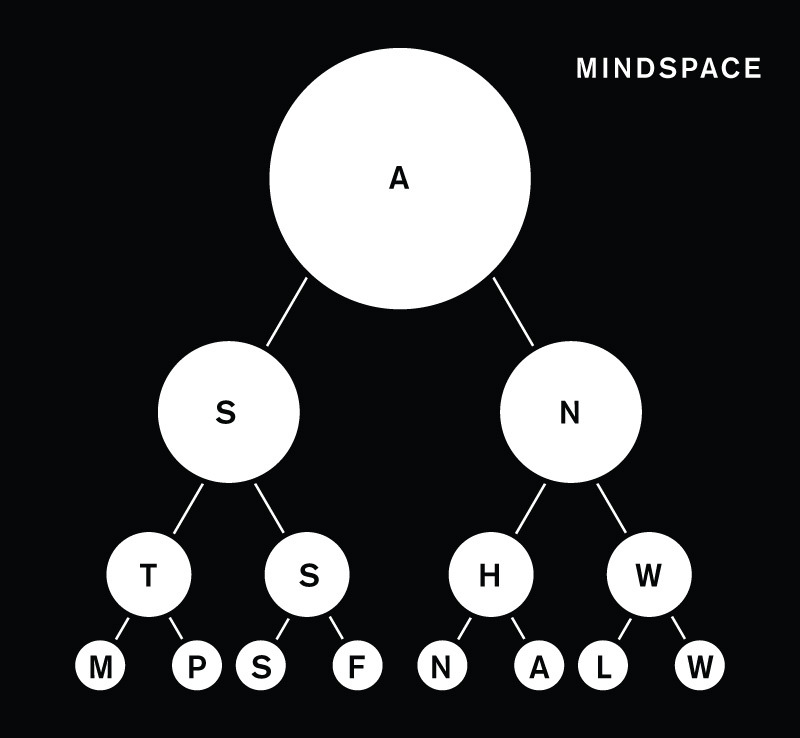 Thought Theory explains that each of our thoughts are reflective of an organized 'mindspace'. The mindspace is geometrical, because it's a mathematical architecture that maintains 'patterns' (that we come to visualize as symbols). Pi, Phi, and e are found in a majority of equations used in classical and quantum mechanics; and I believe they are also vital in calculating the areas of the hyper-dimensional spaces within the mind. They are the most important numbers in the universe, and Thought Theory merges these numbers, their meanings, and their mathematical concepts into a single model that describes the basic processes of any symbolic space. And it reveals something extra-ordinary. Consider that the equation binding the three constants is none other than the Pythagorean theorem, the most respected equation in nature. This equation is unique because it's used to calculate distances between any two points on a spatial plane. And within our brains and our minds, our thoughts must also be organized across distances and spaces. But in contrast to most linear measurements, I think the distances within a mind are calculated in rotations (across its abstract patterns). But why would the connections between pi, phi, and e be significant? Combined together, these three constants appear to create a symbolic space within a rotation. Their function is to architect a hyper-dimensional area that can be populated with relationship patterns (hierarchical, union, network, system, and gear). The patterns are assembled into 'spaces' and the interaction between these spaces leads to intelligent thought and symbolism. ...and the entire mindspace is spread across a grid of dyads. 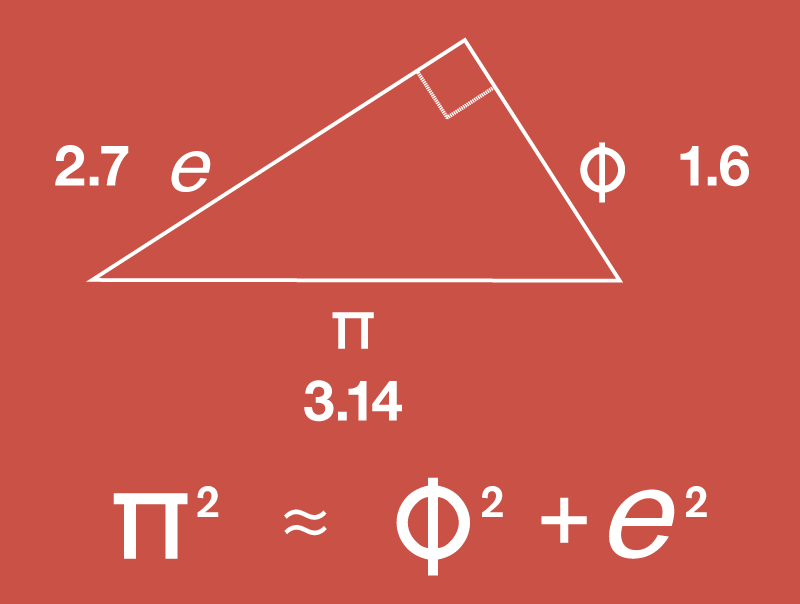 PI, PHI, and e are root concepts that manage the exchange of information (ie. patterns) between pockets of time in a mindspace. And should be thought of as an ideal mechanism that generates natural forces which affect both symbols in a mindspace and arrangements of matter in a physical space, simultaneously. More blog posts on these topic coming soon. Mathematicians have labored for over 6 millenia in order to rid mathematics of 'approximations'. They want to know as many decimals as possible, in order to be increasingly 'precise' - within our seemingly infinite space. Sometimes new tools can turn a measurement from 'approximate' to 'exact'. That's considered an achievement in mathematics. However, there are many calculations that mathematicians can say for certain will never be 'exact'. These calculations always contain an 'irrational' number. It's very important to consider that it only takes 39 decimals places of PI to calculate the circumference of the entire Universe within the width of a single hydrogen atom! ... This means that calculating thousands and millions of digits of PI is not really useful other than for providing an exercise on 'randomness' and 'infinity'. 'More decimals = more precision'. What if only 4 decimals could be produced? What if decimals require 'space', and there are some spaces that just aren't big enough? Each layer represents 10x more precision in calculating the 'depth' of that space. That's where these approximations become very precise. 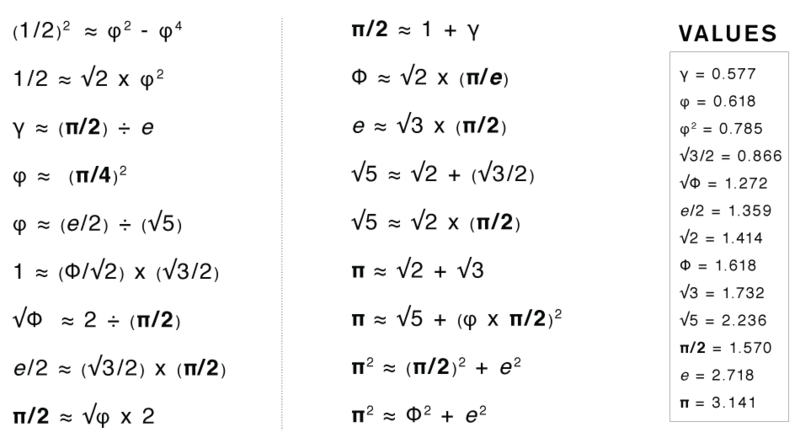 Notice that there are no 6’s 7’s 8’s or 9’s within any of the equations. It's because these numbers are not really as important as the first six (0, 1, 2, 3, 4, 5). The Tetractys represents the first four layers of any mindspace. It's a truncated region, resulting in truncated numbers. So consider that our biological senses function in the range of 100x - 1000x precision. For example, we cannot see a difference between a shape that is drawn in 1,000x or 10,000x (...this is why RETINA displays are about 350ppi, and not 3500ppi). So this coincidence with our senses may indicate that the spaces we create in our minds are founded across a 4-layer hierarchical pattern, that can be calculated with a series of 'approximations'. The approximations are in-focus (and exact) if you truncate all the values before the first 4 decimals, and become out of focus if you do not. I believe that the brain translates these hierarchical patterns into 'symbols' and go on to produce thought as a bi-product of their interactions within the mind. In a future article, I will show how each natural and irrational number represents a hierarchical pattern and the equations joining the numbers can be used to calculate shared patterns. I will also expand on the 'truncated geometries' that exist within these truncated, symbolic spaces. Modern physicists have discovered a majority of the basic functions of the Universe, but they haven't provided any great theories on how its framework came to be. Thought Theory explains that everything originates from the circle, and its three basic divisions (the inside, outside, and border/perimeter). These divisions lead to relativity, quantum mechanics, and even thought, and this is made possible by 'conceptual overlaying' (ie. 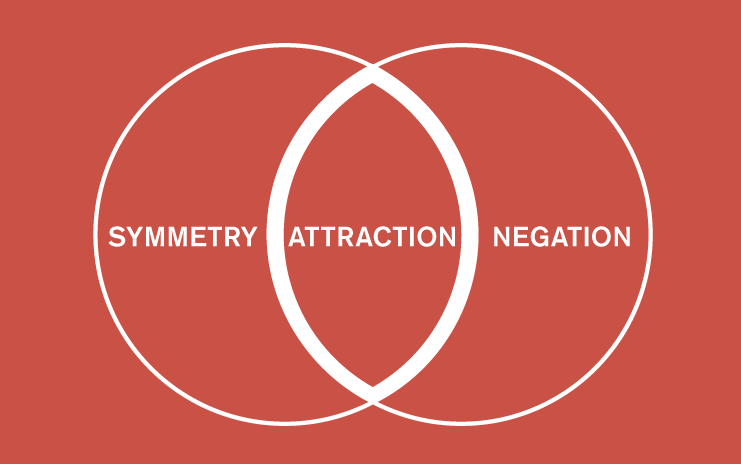 mirror-symmetry). In Thought Theory, it's a fundamental law that allows an object to symbolize more than one concept simultaneously. 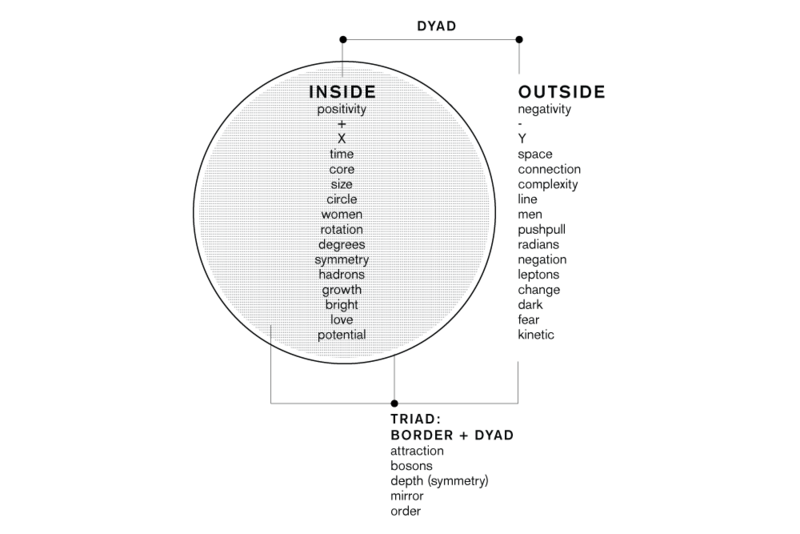 Through conceptual overlaying and symmetry, all of the things we come to discover and realize, fall within the three basic divisions of the circle. The above pattern is of the utmost importance - it can be understood as the Three Principles of Mindspace and can be found at the top of the Tetractys. It is known that in Ancient Greece, a famous metaphysicist named Pythagoras worshipped a particular shape called the Tetractys. He and his followers believed it to symbolize everything that is perfect about the Universe. 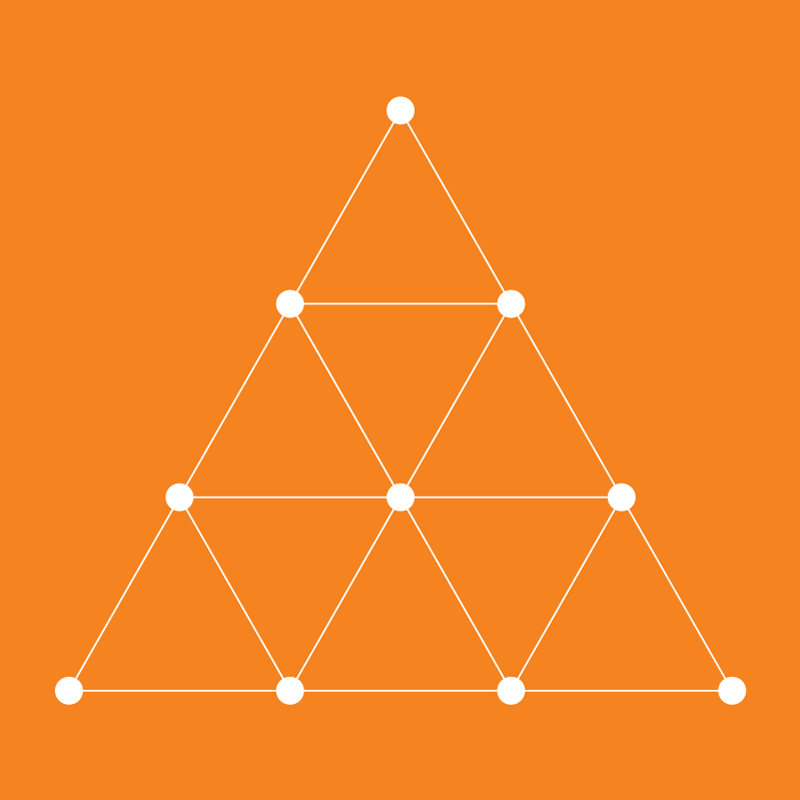 The Tetractys is an equilateral triangle (30°-30°-30°) with 10 interconnected points across exactly four layers. The Pythagoreans believed that this basic shape of nature reveals doorways to the most profound mathematical principles of the Universe. One of these doorways leads to Pascal’s Triangle. Pascal’s triangle is also an ancient concept that Pascal called the ‘Arithmetic Triangle’ when he scientifically re-introduced it in the 17th century. Pascal's triangle is a triangular array of the binomial coefficients, and its form can be considered the base of probability theory while exhibiting an exquisite relationship with the Fibonacci numbers and Phi. 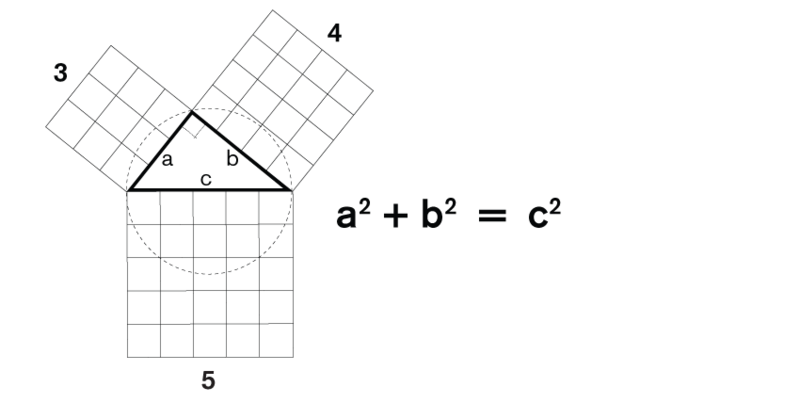 The ‘binomial’ coefficients within the Arithmetic Triangle represent the branches per row in the hierarchy. Pascals triangle compresses 2n circles into just n circles. When mathematicians employ the binomial expansion (ie. Pascal’s triangle), they are calculating individual branches within a hierarchical pattern (ie. binary tree). And the Pythagoreans understood this. Their Tetractys could be thought of as the first few layers, like a capstone, of each hierarchical pattern. The hierarchical pattern that unfolds from the Tetractys reveals the entire configuration of mindspace! The top two rows represent the circle: the border (A), inside (S), and outside (N). And the bottom two rows are all the dimensions necessary to meaningfully describe it as both a stationary and rotating container. It also appears that the duality of rest vs. motion are responsible for assembling the hierarchical pattern in the first place - and reveal the concepts of probability and expansion during the process of creating 'depth'. So the Tetractys DEEPLY represents the circle, the monad, and the primordial symbol for God - while also being the dimensional framework for mindspace. And if you think I’m just making up these connections - consider that the $1 US bill is strikingly designed with this exact symbolism in mind! ...I believe that the founding of the United States upon these symbols, is the source of its global superpower status. 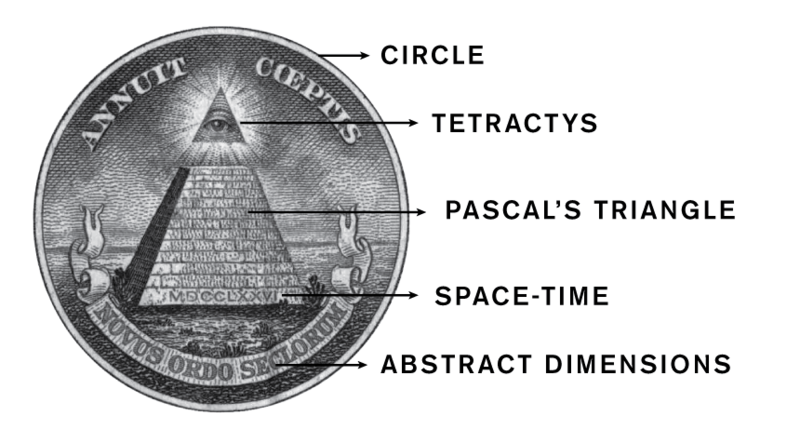 Now read my post about the Tetractys-Mindspace Symbolism. Also note that there also seems to be a generally constant 6:1 proportion of dark matter to atoms (matter with mass). I’m going to provide a model that explains these general observations. 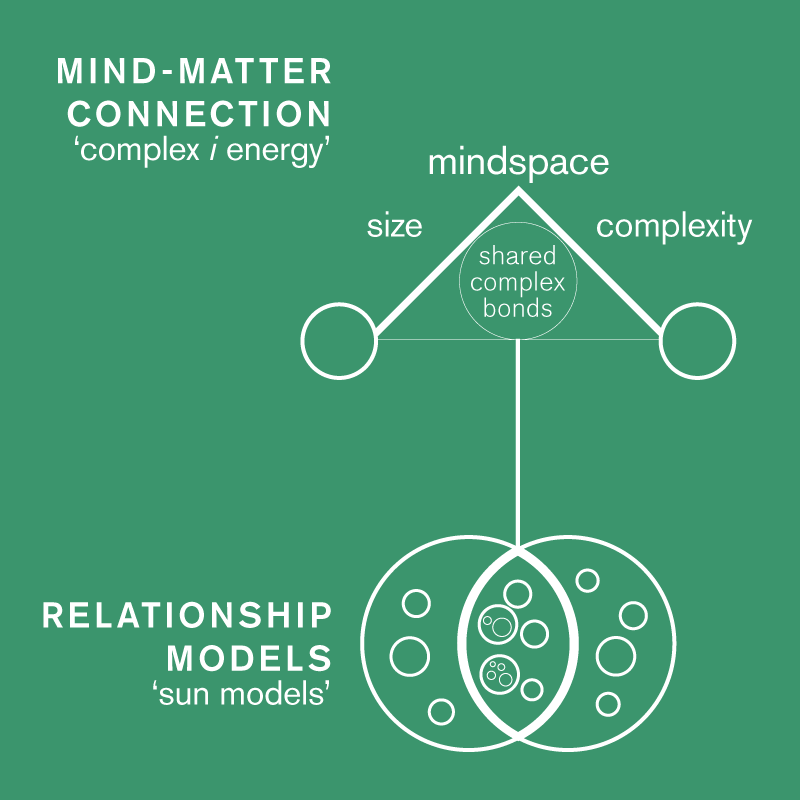 The model is created by referencing the relationship patterns described in Theory of Thought. Prior to the Big Bang, there was a perfectly ordered singularity of space and time that contained all the energy we have in our present-day Universe. Since the singularity, the amount of energy within the Universe has remained constant. And we know the Universe has been expanding ever since the Big Bang, and we also know that the rate of expansion is increasing (ie. exponential rate). Instead of ‘inflating’ the circle, I’m going to illustrate expansion by adding circles within circles, that create layers, which in turn creates ‘depth’. So where are these circles coming from? Time… Time creates these circles in response to ‘events in time’. So in effect, adding circles signifies increasing entropy, and the forward flow of time. So how does this apply to dark Matter and dark Energy? In my very rudimentary model, the total amount of dark energy is proportional to the total amount of layers, while the amount of dark matter is proportional to the total number of ‘kissing’ circles. The kissing number might be the maximum possible ratio between observed quantities of dark matter to matter, if it could be shown that these mysterious phenomenons have everything to do with circle packing. And since each circle represents regular matter, dark matter is a function of the interconnectedness of matter, which gains in strength when there is lots of it grouped together... Hence why dark matter is important when considering galactic bodies rather than when considering small objects like atoms. Now lets take a look at these ideas using the hierarchical pattern. 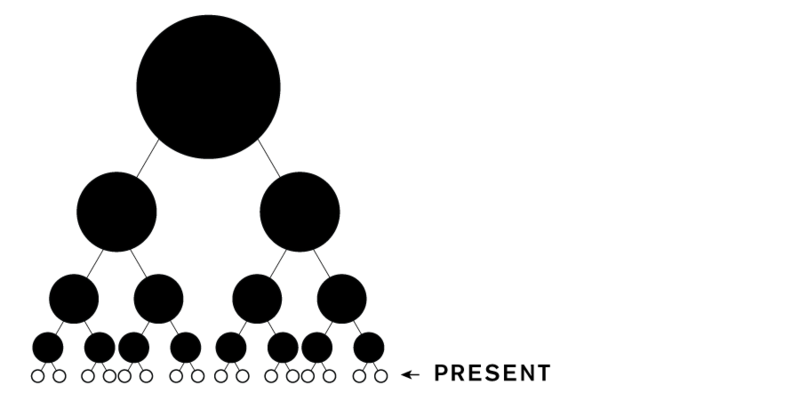 Within a hierarchical pattern, the flow of time adds new circles to the hierarchy. 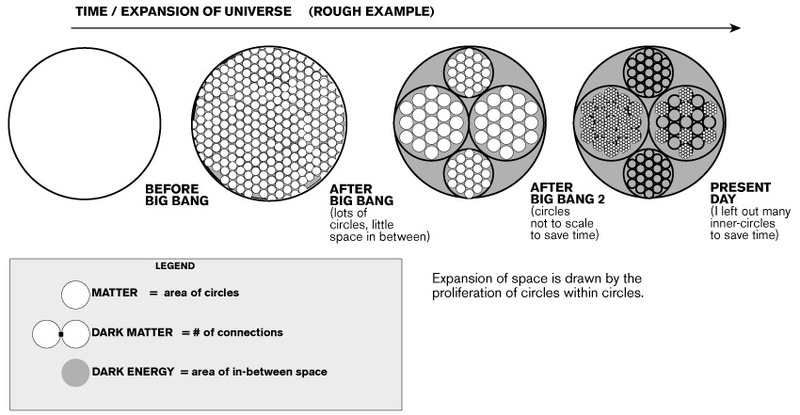 And since the present is the bottom most layer of circles, the upper layers have essentially gone ‘dark’ - yet they are still important when understanding the configuration of total energy. Over time, the total area of the most inner-layer of circles, compared to the area of the ‘dark’ circles, shrinks, signifying a drop in the total matter to dark energy ratio. The hierarchical expansion is also growing exponentially, which might explain how the Universe's speed of expansion is increasing. Over time, the expansion of the universe creates lots of circles within circles - which unlike this diagram, are probably not so homogenous. So 13-14 billion years later, the universe finds itself somewhere within this circles within circles illustration, and we end up with the matter/energy makeup that is currently observed. And there you have it! A simple, hypothetical model explaining the conceptual origin of matter, dark matter, and dark energy. Note: I’m using a VERY SIMPLISTIC model. It is not drawn exactly, and is only meant to conceptualize 3 types of energy. Perhaps an illustration showing their exact progression over time might be done using my approach, but it would require a much more precise measurement of areas, numbers of circles, packing configuration of circles, and so forth. Now learn how the hierarchical pattern, entropy and Pascal’s Triangle fit together! ← What's the Big Difference Between Expansion and Growth? What's the Big Difference Between Expansion and Growth? This growing circle might contain money or people for example, and as it gets bigger it implies that the amount of money or people is ‘expanding’. However, now I’m confused, did I just explain expansion, or was that growth? Is there a difference between expansion and growth? It is a scientific fact that the Universe has been ‘expanding’ for the last 14 billion years. But does that mean it has been growing? Does it have more energy than it used to? No, it does not. The universe has not grown in energy, therefore it has only ‘expanded’. Since it makes perfect sense that GROWTH in energy should be illustrated by different sizes of circles, how should EXPANSION be illustrated? To describe expansion I use the circles within circles pattern. I have done this in reference to thought theory’s ‘system pattern’. Therefore, expansion is not a function of the outer perimeter, but a function of the number of inner-layers. The expansion of any space is an expansion of depth and scale. What the hierarchical pattern shows, that you cannot see easily from the systems pattern, is the ‘depth’ in which the additional systems exist. Expansion is the creation of new levels within the hierarchy, which equates to ‘depth’. Now let me show you how this applies to Dark Matter and Dark Energy. What is an abstract form of energy, and how does a mind manipulate it? These are very important questions that my theory seeks to address. To begin, consider that a mind exists within a mindspace. This hidden space exists all around and within us, and every arrangement of matter is a part of one or more shared mindspaces. The main difference between spacetime and mindspace is that spacetime contains 'empty space', while mindspace does not. Mindspace is a hyperdimensional space that overlaps itself. Its structures are represented as circles and lines and there are no spaces between separated shapes - we only perceive empty space as a function of 'symmetry' (ie. first law of mindspace, to be explained later). In spacetime, energy is calculated by the weight and velocity of an object. If an object has mass, it contains energy. If that object is moving fast, it contains even more energy. The concept of energy was created to explain how one physical body forces change onto another body as it moves across spacetime. Thought theory explains that the circle and line structures in mindspace follow these same observations, however in an abstract sense. For example, 'a rock' and 'a bottle of Coke', of the same weight, moving at the same speed, contain roughly the same amount of energy. 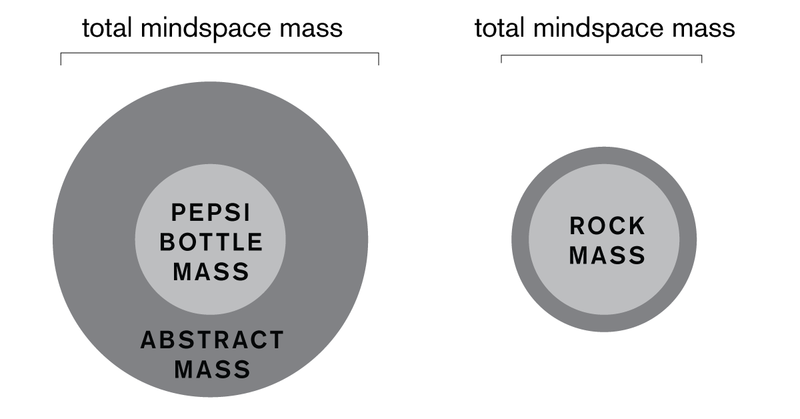 However, from the perspective of a mindspace, a bottle of Coke will usually contain more energy than a simple rock of similar weight and velocity. The additional energy exists because a bottle of coke contains specific arrangements of relationships (designs, words, numbers) that create overlapping mindspaces. This infuses a bottle of coke with 'abstract' energy, which causes the displacement of people around it. This energy is stored within the arrangement of its matter (ie. structures of information like its logo). Traditionally, physical energy is calculated by adding together all the sizes and speeds of its atoms - it does not take into account the 'arrangement' of these atoms such as logos, words, pictures, etc. In thought theory, the abstract energy must be somehow included when calculating energy. In conclusion, the abstract properties of matter generate pulling and pushing effects that are exerted on the minds of neighboring people (and other living things), and thus qualifies as a form of energy. In Thought Theory, the Three Principles are the basic philosophies of mindspace and the Universe. Btw, I call this illustrative process ‘conceptual layering’. ← What Is SpaceTime Within Thought Theory? What Is SpaceTime Within Thought Theory? The network pattern demonstrates how the two concepts differ in shape, meaning, and function. For example, time is circular and is used for storage, while space is linear and is used for exchange. In contrast, the union pattern reveals an intersection between them. The benefits of using patterns to describe spacetime are in developing a clearer picture of a hyper-dimensional structure. Think of a symbol as a object that exists within an intersection of space and time, and which can be visualized in 5 different ways. If patterned symbols are actual objects (called Universals in Plato's theory of forms), then the Universe is quite simply an architecture of self-similar circles and lines spread across some depth (ie. fractal cosmology). And in thought theory, the Universe can even be described without using the words 'time' and 'space'. Within the Universe, circles establish pathways to exchange energy, fueling their growth and expansion. The pathways are forged by the electromagnetic field. Patterns could help explain why the Universe is in-homogenous and may even explain the existence of dark energy and dark matter. Think of an atom, or any large arrangement of atoms, as the tip of an iceberg. Above the fold we see matter, however hiding below are massive patterns. If our traditional 4-dimensional view of spacetime overlooks the tip of an iceberg, then a mindspace perspective sees the entire iceberg including spacetime and the region below it that explains abstraction.